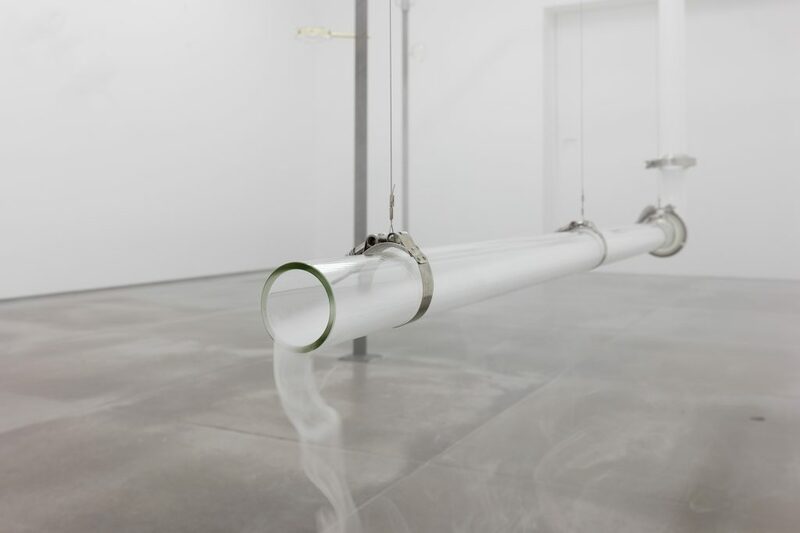 “Laura Vinci: Morro Mundo,” at Galeria Nara Roesler, is destined to be one of São Paulo’s gallery highlights of the first half of 2018, after a run at the gallery’s Rio de Janeiro location in 2017. 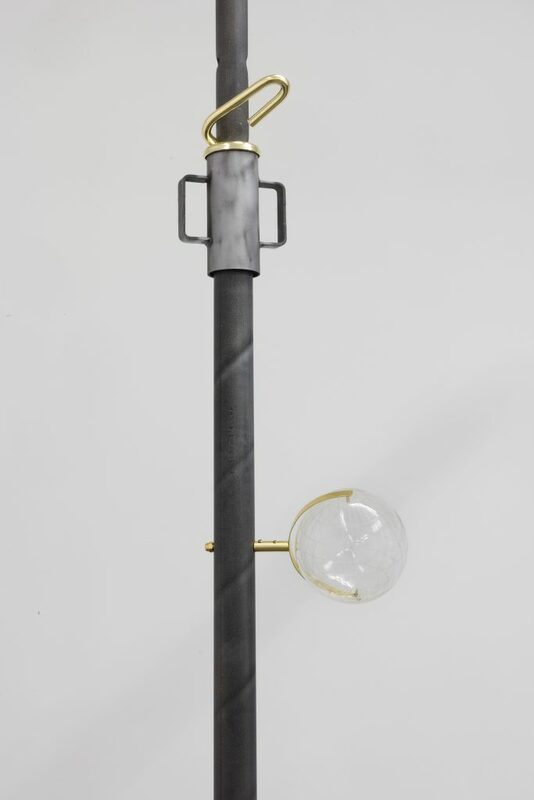 No holographic illusion and no clutter in this low-tech, enigmatic exhibition combining hardware-store supplies with immateriality, the void and time—the triad of dilemmas central to the poetic gravitas of the São Paulo-born fifty-six-year-old artist with a prominent Tuscan surname. Beginning in the 1980s with painting and then sculpture, Vinci came to prominence at the 1997 Arte/Cidade Project. The untitled installation that visitors dubbed “Sandglass” consisted of a play with an hourglass that measured—like life itself—only a single lapse in time. A thirty-ton, three-meter-high pile of fine sand on the third floor of an abandoned building in São Paulo trickled through a small hole in the flagstone slab, gradually forming another pile in the floor below. This time, the visitor is involved in an ethereal zeitgeist or, simply put, by a mysterious milky haze. 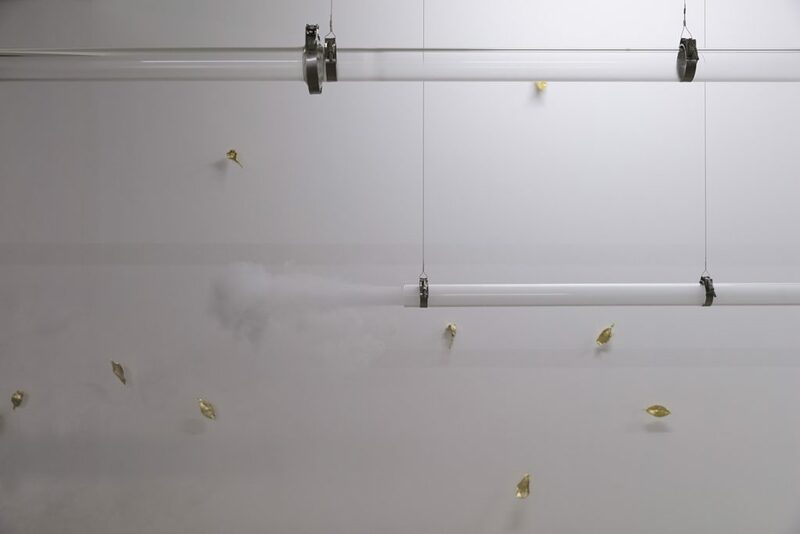 A pristine white boiler-room-like space is mapped by a crisscross of plexiglass pipes through which a sensor pumps out white fumes that draw swirling figures in the air. 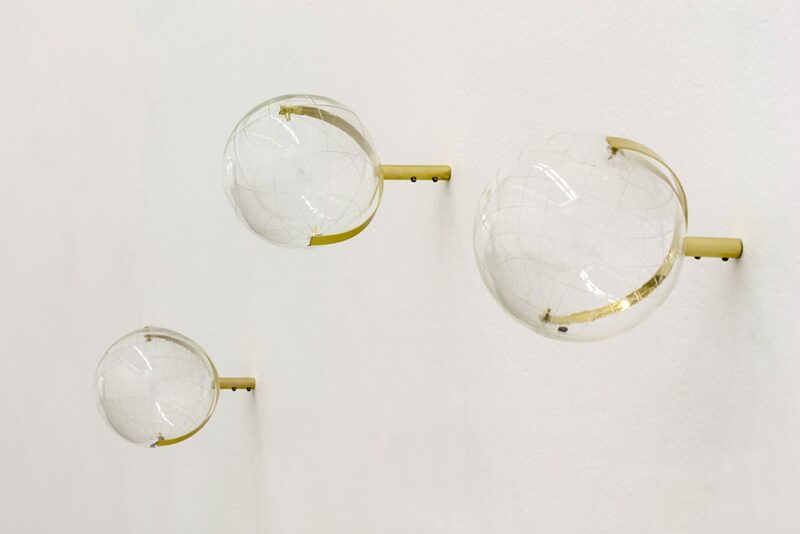 Pinned to the walls and braced by steel pipes you will find gold-bronze-plated leafs as if blown by the wind, as well as classic measuring instruments such as small jeweler scales and miniature crystal-clear glass globes etched with the lines of latitude and longitude. The measuring instruments are vessels for tiny garnet crystals cut in X fashion that echo the red target X of a shooting range projected on to a wall. A red semi-precious stone, garnet, or granada in Portuguese, is a homonym for grenade. The garnet stone, symbol of determination and desire for change, subtly concentrates the political cachet of the installation. 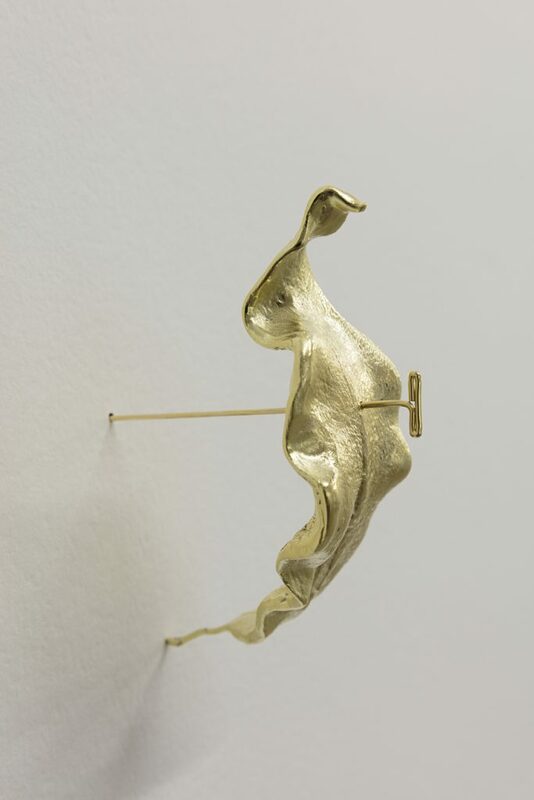 The work of Laura Vinci has been presented at the Biennales of São Paulo, Mercosul and Cuenca, in Ecuador, and abroad to name a few in the RMIT University, Melbourne, Australia; Palazzo delle Papesse, Siena, Italy; Galeria Mario Sequeira, Parada de Tibães, Portugal; Galeria Punctum, Lima, Peru; Copa da Cultura, Haus Der Kulturen Der Welt, Berlin, Germany; and at the Malba, Buenos Aires, Argentina. 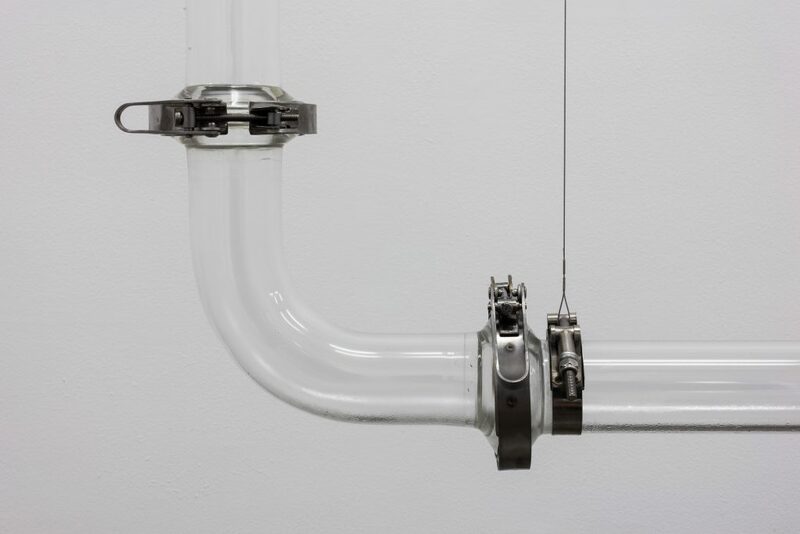 Her installation “Máquina do Mundo”(Machine of the World, 2005) belongs to the collection of Instituto de Arte Contemporânea Inhotim. Other Brazilian collections with her works are Centro Cultural São Paulo; Museu de Arte Contemporânea da Universidade de São Paulo; MAM- São Paulo; Pinacoteca do Estado de São Paulo; and Instituto Figueiredo Ferraz, Ribeirão Preto. 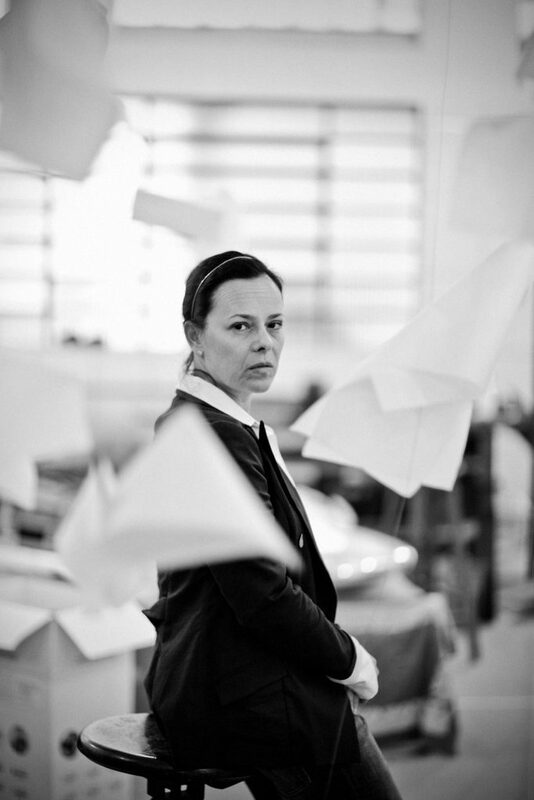 In the States, she has shown in 2014 at Miami’s Art Center/South Florida and in 2001 at New York’s Museo Del Barrio. 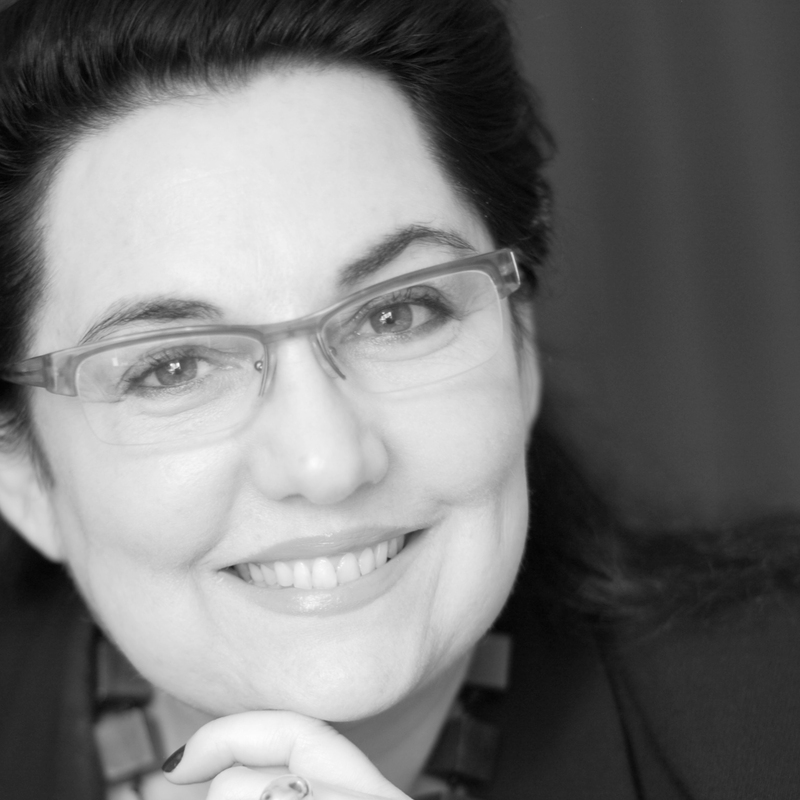 In 2006, she delivered a talk at the University of Berkeley, California, while her husband, architect and essayist Guilherme Wisnik, was the visiting scholar on Brazilian literature. In 2012, the couple lived in Chicago’s Hyde Park area during Wisnik’s residency at the University of Chicago. “I made a series of photos of Lake Michigan and saw a lot of interesting architecture and museums,” she recalls. Laura, in many ways your work takes the viewer to a stage beyond the painting by Caspar Friederich, “The Monk by the Sea”(1808-1810), where one only sees emptiness paradoxically filled with a most sublime void. Is this reflection on the right track to understand the sensorial immateriality of your art? Yes, indeed, Caspar Friederich’s painting is most beautiful! It unveils the dimension of the world in its void and makes me think of a song by the great Gilberto Gil that I still listen to today: “Copo Vazio” (Empty Glass). Gil wrote it during our military dictatorship for a record by Chico Buarque. There is a stanza that goes: “É sempre bom lembrar/ Que um copo vazio/ Está cheio de ar” (Always good to remember / that an empty glass / is full of air). It made me understand there is no such thing as the void. The void is always overflowing with matter, with circumstances and never-ending motion, and we, with our bodies, are all a part of it. How do you explain the concept behind the installation and its relation to the title? How do you conceive your projects? It all begins with lots of notes and drawings in small paper notebooks; I find it hard to draw on large sheets of paper or notebooks. The next phase is developing physical or virtual models, then the prototypes followed by monitoring and evaluation of the materials. Were you one of those kids who wanted to be an artist from the start? Yes, I guess I was. I was always finding ways to express my myself through matter, through building things, I created papier-mâché toys, enjoyed doing patchworks… I am the fourth in a line of six kids and the only girl to have a space all my own to create my playthings. My first studio was in my grandmother’s house when I was fourteen. What made you embrace this profession? Your Vinci family name? I have Italian citizenship—my grandfather was born in Tuscany nearby the city of Vinci—however, I only made the connection with Leonardo da Vinci later on, since the Portuguese C is not pronounced in the soft Italian C sound. In Brazil our family was the Vincis with the C sounding like a hissing S.
Your projects seem simple on the surface but you must have the mind of a project coordinator to create all the unlikely links that sprout from your work. How do you negotiate with chance? Most of my projects engage mechanical, electrical, hydraulic or thermo driven systems. Some are very basic, for example, the fans for “Papeis Avulsos” (Loose Paper, Art Center/South Florida, Miami, 2014) or “Batéia”(Gold Panning, CCBB, Rio de Janeiro, 2014). 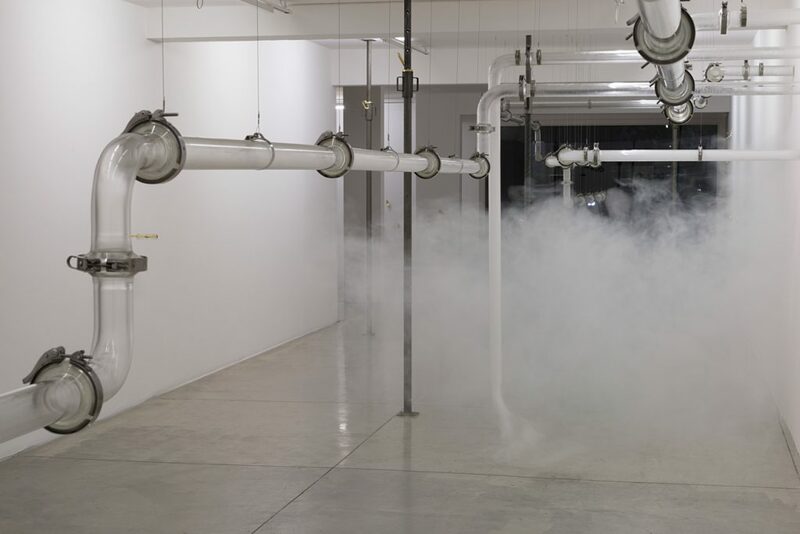 Others are quite complex undertakings like “Palavras Congeladas”(Frozen Words, CCBB, São Paulo, 2002). I always work with a team of experts, engineers, electricians, but intuition remains a fundamental tool in the making of my narrative. What led you to create an art that juggles with the immaterial plasticity of illusion? In terms of reference, Land Art has played a major role in my formation. Every time I see images of Walter de Maria’s “The Lightning Field” (1977), I find the world a better place. Watching again and again the dance performances of Pina Bausch is very inspiring; for me Pina is the greatest artist of the twentieth century. Brazilian Tropicalism and a large part of the post-tropicalist music production have also been very influential. I grew up listening to Caetano Veloso, Gilberto Gil, Chico Buarque, Maria Bethânia, Gal Costa, Jorge Ben. The beat of the atabaque drum (Afro-Brazilian Jacarandá wood drum) playing along with the electric guitar seemed wonderfully natural to my ears. Through their lyrics I learned free creative thinking is a transforming force and love is a creative power. I grew into a free-spirited woman, I feel like the women in their inspiring music, Rita, Ana, Barbara, Morena, all in one… I have no doubt I became an artist because all this musical mantra made its way deep inside me.